Ludlow in Shropshire is a gorgeous country market town which at one point boasted of more Michelin starred restaurants per capita than anywhere else in the world. One of these included Hibiscus before Chef Claude Bosi relocated the restaurant to London (Mayfair) in 2007. A brave move many said, but it seems to have worked out just fine for Hibiscus. Not only did Hibiscus regain its second Michelin star which it lost when it first moved, but it also now holds a place in The San Pellegrino 50 Best Restaurant’s Awards. With Fox and Grapes, Bosi makes another mark on the London dining scene. Brother Cedric manages the day-to-day while Patrick Leano, formerly the sous chef at Hibiscus, runs the kitchen. The site of an old London inn on Wimbledon Common, the gastropub retains many original features and is lovely and quaint. It was hard to think that Fox and Grapes would be any ordinary gastropub given its affiliation with Claude Bosi. That said, the mains on the menu were fairly uninteresting (sausage and mash, gratin provencal (ratatouille), mutton moussaka, pollock, chicken, and steaks, etc) and not as inspirational as it could have been given the Michelin-starred status of the gastropub’s patron. 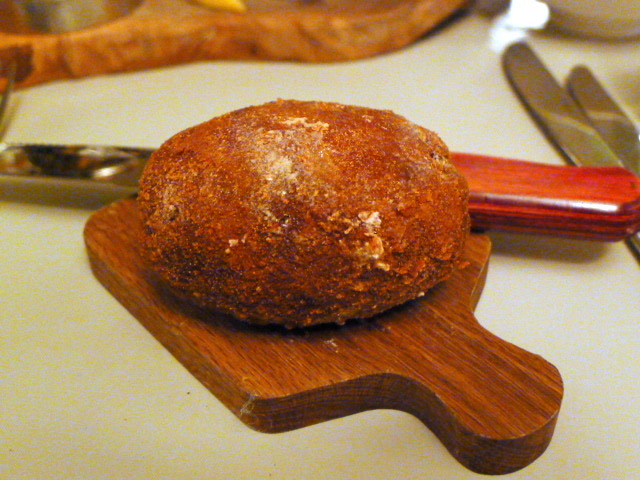 We kicked off with some bar snacks including a wild boar scotch egg (£4.50) which gave way to a runny yolk centre. But the boar meat, whilst well cooked and decidedly gamey in flavour, was too peppery. 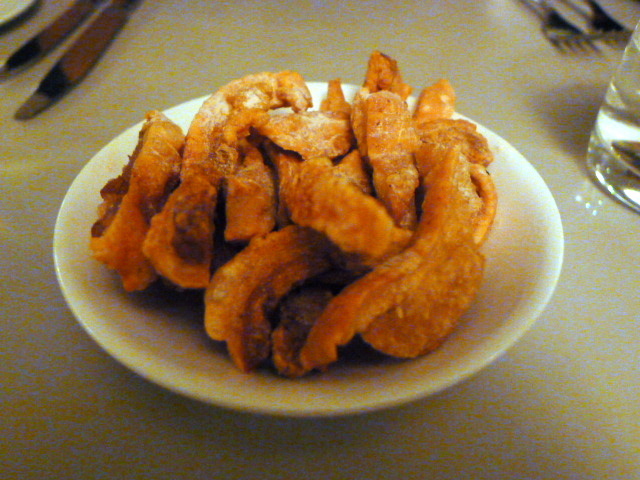 A portion of pork crackling (£2.50) was also extremely over seasoned. Crackling should be a little salty, but this was too salty too be enjoyable. 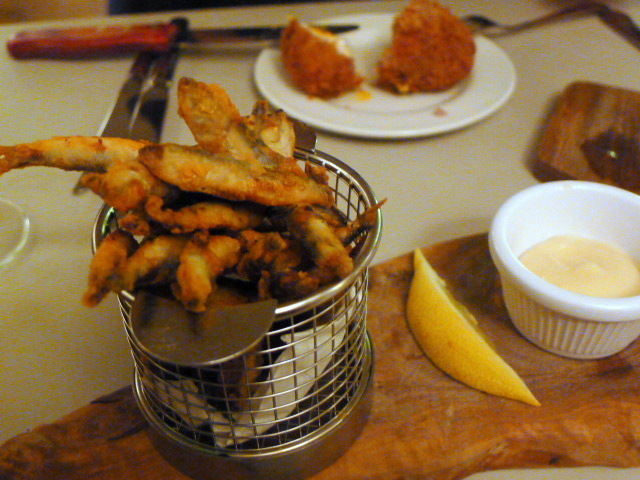 Deep-fried whitebait (£4.75) was pleasant. 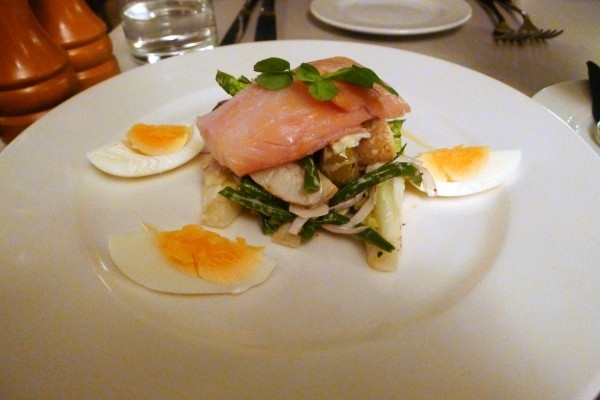 Smoked Scottish haddock with hen’s egg in a nicoise style salad (£8.50) was disappointing. The fish did not taste fresh and was unpleasant to eat. The potatoes were overcooked, and overall this was a limp and unappetising dish that was best left untouched. 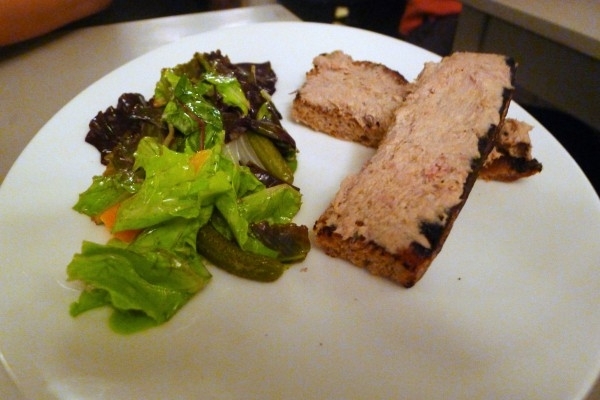 Aylesbury duck and foie gras rillette with homemade pickles (£7.50) was served pre-spread on sourdough toast. To my mind rillette should be served in a ramekin for the diner to spread. This helps to ensure that the bread maintains its crispy toasted quality when first brought to the table. But it also didn’t help that the rillette lacked the unctuous quality of lots of lovely fat running through it which would have helped to give it a rich depth of flavour. Traditional Scottish langoustine cocktail (£9.50) wasn’t half bad even if it was very 1970s. But it did seem poor value for money. The batter on an English brown ale battered Scottish hake (£13.50) was supremely good with its light and crispy qualities. The fish was also fresh, moist and very tasty. The dish was served with chips (as per the menu) which turned out not to be chips but potato wedges that weren’t particularly crunchy. 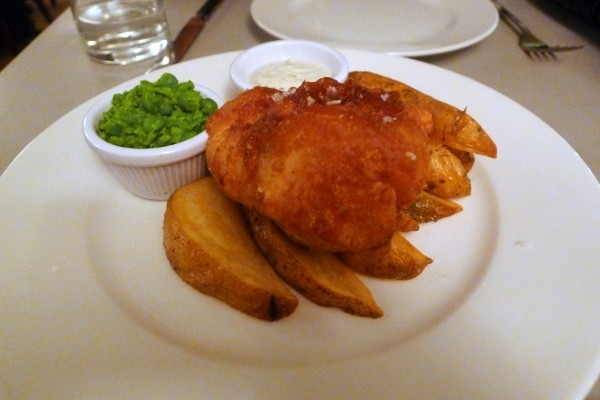 There were also some mushy peas which were a little peppery. We skipped dessert as we couldn’t face another round of disappointment. Poor seasoning, bad preparation and suspect produce made for a dreary meal. The service was pleasant, but there was little else that we could find redeeming about this experience. If I was a two starred Michelin chef, I would be embarrassed to put my name behind something like this. 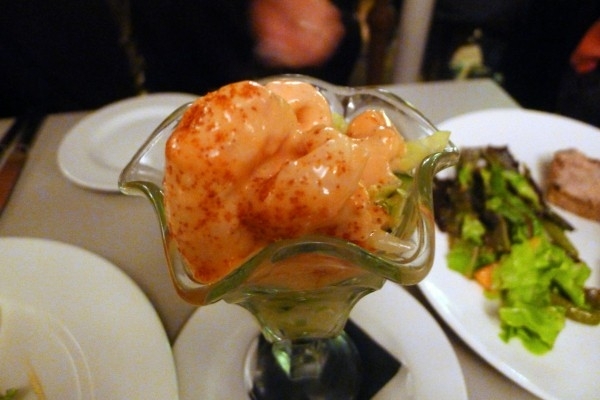 Price range: £27 – £50 for three courses. Excludes drinks and service. Ah..a friend of mine went as well and wasn’t too impressed. That scotch egg looks horrid; why is it so snooth and shiny? Likewise those wedges, and the pitiful salad. I’d have been very annoyed. Sounds like your friend had a similar experience to me. I agree. The scotch egg doesn’t look great. You can still see bits of the flour. I wouldn’t recommend this place.